It puts the integrated vegetation management of railway companies and the herbicide use within this context into perspective. 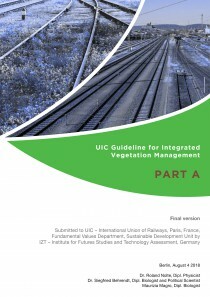 It shows that the vegetation management of railways and especially the use of herbicides are embedded into an overall environmental strategy of railway companies aiming at improving the environmental performance and into a legal context on EU, national and local levels. It demonstrates that railways are using herbicides in a responsible way governed by clearly defined principles, guidelines and quality standards and that systematic effort is put into the further reduction of the total amount of herbicides used and the areas treated.